I will be teaching muscle testing which is a method to test how your body is functioning, rather than if you have a disease or not. Most diseases start way before any tests show abnormal findings. Functional health prevents disease over the long haul. Comparing disease states to organ functional health is like comparing apples and oranges. For example, you may have an irritated gallbladder, without any gallbladder disease. Functional health practitioners like myself would find a gallbladder dysfunction often after you have undergone all the testing one could possibly imagine. Just because tests don’t show any abnormalities does not mean you are healthy. You may be heading for a disease if you do not address the early dysfunction. Muscle testing helps prevent disease onset. Much of it is based in understanding organ function and magnifying wellness. Meridian muscle testing originated with Dr George Goodheart who developed Applied Kinesiology. By testing points that are derived from acupuncture meridians you will learn to assess if there is too much or too little energy going through and organ point. This signals an imbalance. Once the energy is out of balance the muscle test will show up as weak. All foods, supplements, thoughts, herbs, and beings are based in energy. It is the root of us all. We are part energy/quantum physics and part Newtonian/ physical form. Both exist in us. Testing the energy field and how it responds to foods, thoughts, feelings, and supplements is one of the most powerful ways to get to the cause of an issue. How to tap into that intelligence is what this class will be about, and you can then use it on yourself, your family, friends, and client's. 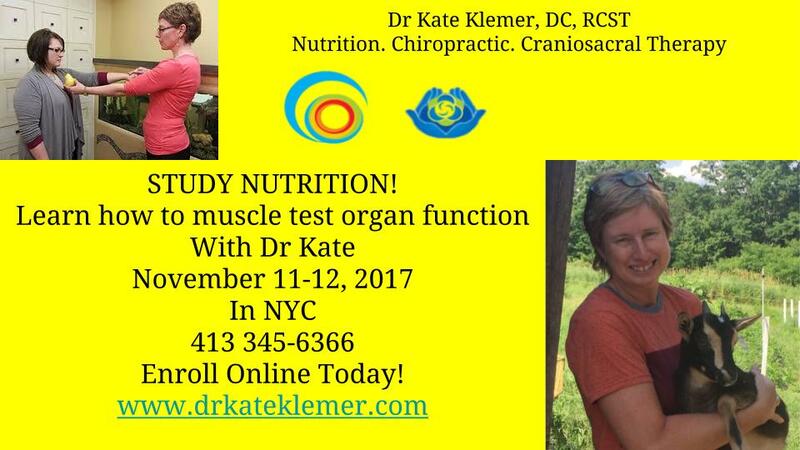 Dr Kate started learning Nutritional muscle testing early on in her practice that she started in 1989 by studying with many different teachers such as Dr Versendaal, Dr Anderson, Dr Brimhall, Dr Dunn, Dr Bone, Dr Bland, Dr Haywood, and others. She is also a certified biodynamic craniosacral therapy teacher through the Biodynamic Craniosacral Therapy Association of North America. Her practice is an unusual and powerful holistic blend of Cranial work, Nutrition, and Chiropractic for optimal wellness care. She has seen very powerful results in helping to educate and heal patients around supplements, foods, and emotions with muscle testing. She is excited to share that with you this weekend! The class will be taught with lectures and then a practice session. We start every morning with a mediation.